Got this review from Canadianwhiskey.org. I personally rarely drink whisky. But I make an exception for this gem. This is a great review and great back story to go with it. Gibson, one of Canada’s most respected names in whisky, started out south of the 49th parallel as a most-respectable Pennsylvania rye. In the 1830s, in a tiny bustling distillery on the Monongahela River in western Pennsylvania, John Gibson began making rye whisky. Gibson’s distillery soon grew into a large, prosperous, and very well-known establishment, and by 1856, it had expanded to cover over 40 riverside acres. All of that changed in 1920 when Prohibition closed the distillery doors. Shortly afterwards the entire Gibson plant was demolished and sold off, stone by stone. Lewis Rosentiel, a New York entrepreneur, was confident that Prohibition would eventually come to an end. In anticipation of that outcome, his company, Schenley Industries, was busily buying up distilleries, ageing whisky stocks, and brands. One of the brand names Schenley acquired at that time was Gibson’s. Unfortunately, Rosentiel arrived on the scene too late to save the Gibson distillery itself. That was bad luck for American whisky lovers but good luck for us here in Canada, as we can taste in this fine 18-year-old example. In 1945 a Schenley subsidiary called Schenley Distillers Corporation established a distillery in Valleyfield, Quebec. Then, in 1972, using whisky distilled at Valleyfield, Schenley re-introduced the still-familiar Gibson’s name to the American whisky market . That’s right, when the Gibson name re-surfaced on whisky bottles they no longer contained Pennsylvania rye, but rather, an equally fine Canadian whisky. That same Valleyfield distillery, now owned by Diageo, is where this particular bottling was made. Nose: Pine sawdust, with loads of oak—dry but not drying, and the luxurious sweet fragrances of vanilla, toffee, and caramel. Rich yet dry, with lots of spicy rye, fruity rye, dusty rye, and a couple of drops of pickle juice for good measure. Fleeting dark fruit, prune juice, then sour green fruit stand out from the generic sweet rye fruitiness. And out of nowhere comes a contrasting whiff of green wood. Palate: The first sip is rich in caramel, toffee, vanilla, and fresh sweet corn until spicy oak and hints of pepper turn quite hot on the tongue. This whisky showcases one of the unique characteristics of Canadian whisky making. When it is distilled, the new spirit is divided into different streams, some rich in grain-derived congeners and some less so. Generally, these are aged separately then re-blended when mature. Some whisky makers have suggested that this process recasts the oak flavouring that in other processes, can actually overpower older whiskies. With Gibson’s Finest 18 year old, like so many Canadian whiskies in the rich and oaky flavour camp, it seems the longer the whisky sleeps in the barrel the fresher the woody notes become. Here, after 18 years in wood, an initial flurry of cedar and fresh sawdust resolves into a fragrant base for a whole range of rich and flavourful delicacies. Hot pepper dominates, but not so much that you can’t appreciate some unusual flavours in there too, like biscuits, vitamins, and Juicy Fruit™ gum. The citric zest keeps it clean, showcasing the complexity. This is rye whisky that is loaded with rye crisps and hot baking spices. There is fruity chewing gum, yes, but overall it’s not a very fruity whisky on the palate, except for a little sour kiwi that manages to poke its nose though the citric notes. Finish: Medium. Hot and spicy with fading pepper and zesty bitter lemon. Loads of wood and rye spices, then some sweet fruitiness towards the end. Empty Glass: There is not much left the next morning, except a touch of fresh pine sawdust and a hint of prunes. But there are more plot twists to the Gibson story. 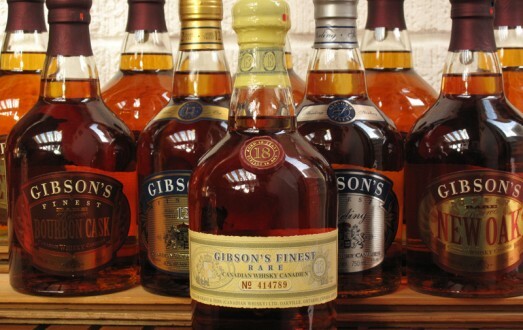 To begin with, Gibson’s whiskies, now called “Gibson’s Finest”, are currently available almost exclusively in Canada. Ownership of the brand has shifted to William Grant and Sons, and there are plans firmly in the works to resume exports to the USA. However, these plans are not expected to materialize for at least another several years. As well, the production of Gibson’s whiskies has moved from Valleyfield to a new home at the Hiram Walker distillery in Windsor, Ontario. Some tasters find the new batches of Sterling and Gibson’s 12-year old being produced at Walker’s just a little more expressive than the original Valleyfield versions. But if there is any difference at all it’s not in the whisky. Gibson’s have enough ageing Valleyfield whisky on hand that it will be at least 4 years before they make the switch to Walker’s warehouses to source aged whisky. Supplies are slowly being shifted to Windsor, but for the time being most of the ageing Gibson’s whisky is still held in Valleyfield. Although they are now bottled in the Windsor plant, the 18-year old version is still blended at Valleyfield as are occasional batches of the Sterling and the 12-year old. Incidentally, you can identify the Valleyfield bottlings by their distinct acorn-style bottle caps.